A friend mentioned going to bake chiffon cake with dried blue pea. I never tried before and wonder how the colour will turn out. 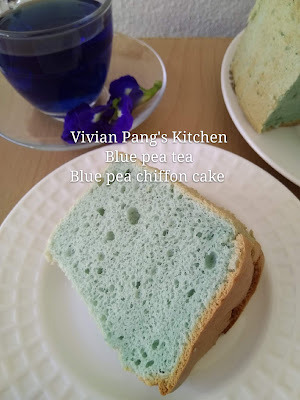 Well here is the look of my blue pea chiffon cake. Making kimchi soup is easy and fast! It is pretty much a one pot meal with well-balanced nutrition. Kimchi provides vitamins and mineral, pork and tofu give protein. It is comforting especially serving it hot or warm along with rice. Kimchi is a traditional fermented Korean side dish made of vegetables with a variety of seasoning like chili peppers, garlic, scallions, and other spices. Among kimchi varieties, napa cabbage kimchi is very common.